The almost-entirely tallowwood kitchen is custom. Muuto pendant lights, bar stools by Alvar Aalto for Artek, a Vola faucet, and a ceiling fan by Beacon Lighting finish the room. The courtyard deck is also made of tallowwood, a native eucalyptus. White mahogany—a dense timber that is termite resistant—clads the exterior. The sustainably sourced timbers are also fire resistant, a crucial feature in Australia in light of frequent drought and resulting forest fires. Räsymatto bedding by Marimekko in the studio is complemented by a green Anglepoise lamp from Sydney boutique Planet Furniture. The wood stove is the Rondo model by Rais. Situated in a quiet grove of sculpted tea trees, the house that architects Annick Houle and Stephen O’Connor have created for themselves on Australia’s Mornington Peninsula is completely at home in the natural world. Tea trees, a protected species, dot the property, into which the architects wove a single-story structure with an adjacent studio building. The private and escapist enclave is shared by Houle and O’Connor with their two children, Louis and Clara, and sits in complete contrast to the family’s period Victorian house back in Melbourne. The house is a five-minute walk from the ocean at Pirates Bay and a 20-minute walk from the nearest village. The Mornington Peninsula itself is a place of extraordinary natural beauty with a mesmerizing coastline, much of it within a national park. After they bought the land in 2009, Houle and O’Connor discovered that it had once belonged to the celebrated Australian painter Albert Tucker. Coincidentally, one of the practice’s best-known projects to date is a redevelopment of the Heide Museum of Modern Art, just outside Melbourne, which included the new Albert & Barbara Tucker Gallery. The family took the discovery as a positive omen. Taking cues from Japanese design, the house was designed around a courtyard, explains Houle, who says, “It brings the calmness of the landscape right into the plan of the house.” The courtyard is bordered by a floating deck, sitting among the tea trees, which leads into the main body of the house. The L-shaped building has a master suite at one end and the children’s bedrooms at the other. Between sits a central, open-plan living space that leads out onto a long terrace, partially sheltered by the overhanging roofline. 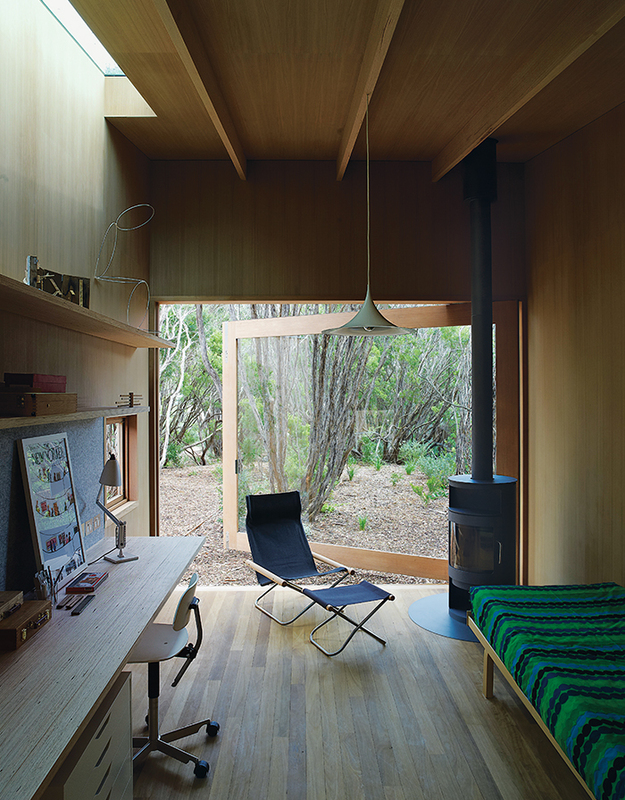 In a separate pavilion, connected to the main house via a timber walkway, is the studio—used by visiting guests and as an office. The central living space is a beautifully detailed wooden box, with large sliding-glass doors to one side—connecting to the terrace—and high clerestory windows. 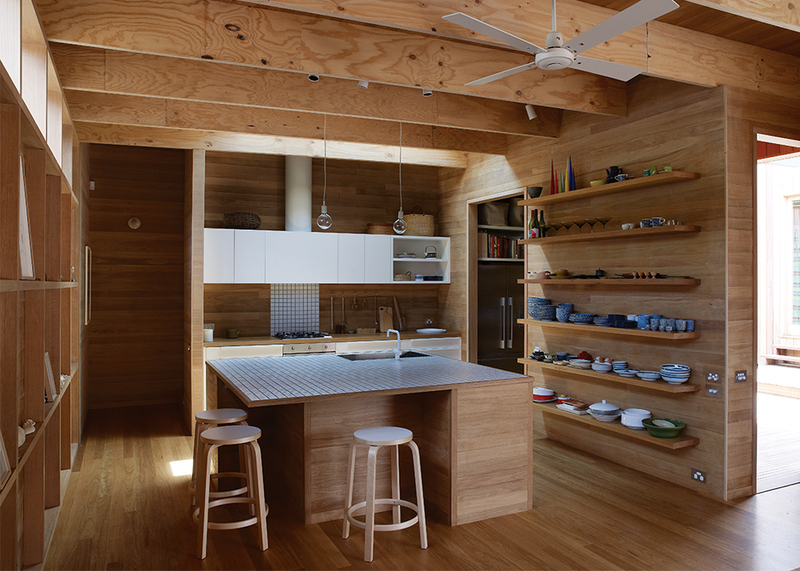 The laminated roof beams are exposed, while the horizontal beams of the timber wall paneling double as display shelving. O’Connor and Houle custom-designed many elements within this multipurpose space, including the kitchen and the fireplace wall. The chimney buttress is composed of a dark-gray Boral brick made out of concrete. The brick offers the perfect foil to all the timber, with a contrasting color and texture that is still in tune with the warm, earthy interiors. The materials chosen for the house tie in with the rugged, rural setting and reinforce the organic quality of both site and building. “We wanted to follow the typology of the typical local Australian beach house,” Houle explains, “so we used lightweight construction clad with native timbers that are bush-fire resistant.” The structure is made with laminated Oregon beams, capped with zinc as they project out from the house to protect them from the salt air. Tallowwood, a native eucalyptus, was used for the decking and also for the internal flooring and wall paneling, including in the master bathroom. “It gives a tactile quality, as well as being visually pleasing,” Houle says. The bathroom features an oversize sliding window, which retracts to offer a direct connection with the woodlands beyond. The purity of the timber-lined space is underscored by a bespoke ofuro tub. Louis and Clara, ten-year-old twins, have a dedicated zone of their own, including a playroom complete with a Nanna Ditzel–designed rattan chair hanging from the ceiling. Their bedrooms, separated or united by a sliding pocket door, have custom bunk beds designed by their parents. The studio, set apart from the rest of the house, is a haven in itself. The space has a pronounced Scandinavian influence, with its built-in desk, wood-burning stove, Alvar Aalto stools, and an Aalto daybed. Yet, for Houle and O’Connor, Pirates Bay is primarily a place for family downtime, rather than working. The family enjoys swimming at the beach, fishing, and bush walking. This is the most peaceful of retreats, in which a simple but seductive palette of materials lends a sense of calm. It may only be one hour from Melbourne, but it feels a world away from everything.